Your decadent night out in New Orleans begins with boarding the Steamboat Natchez in the French Quarter. The authentic paddle-wheel steamboat is the only one still operating on the mighty Mississippi River today. Pose for a photo as you board -- you'll receive a print as a souvenir of this exclusive experience that can only be booked through Viator! Uniformed ship staff will greet you with a Champagne cocktail served in a glass etched with an image of the Steamboat Natchez that's yours to keep. Then, follow your officer of the vessel guide on an exclusive private tour of the boat and its impressive, museum-quality engine room. Feel free to ask questions and take photos as you tour the magnificent steamboat. Afterward, take your reserved seat and listen to the live jazz band, Dukes of Dixeland. As you listen to the Grammy-nominated group play, enjoy a shrimp cocktail and glass of house wine. Then load up on scrumptious Louisiana favorites including Filé Gumbo and Louisiana style fish at the dinner buffet. Sit back, relax and delight in captivating night views of New Orleans as you cruise along the Mississippi for two hours. 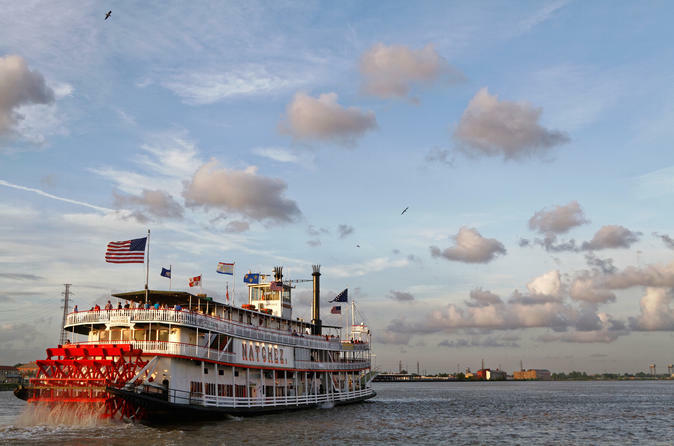 Before your luxurious dinner cruise concludes in the French Quarter, you'll also receive a commemorative Steamboat Natchez pin and Dukes of Dixieland CD as souvenirs of your memorable night on the Mississippi. Receive all the luxuries of the original tour, but include an open bar (call brand select cocktails, beer and house wine) for the entire duration of the cruise.